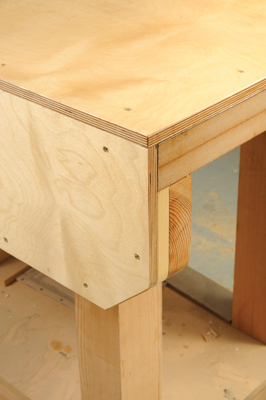 The heavy duty workbench I use in the Woodworking Plans & Projects workshop corner was originally made by the previous editor of Furniture & Cabinetmaking magazine, Michael Huntley. It was tall like him, so I cut the legs down as I am a bit shorter. Benches can be any height that suits you or the work you are engaged in. 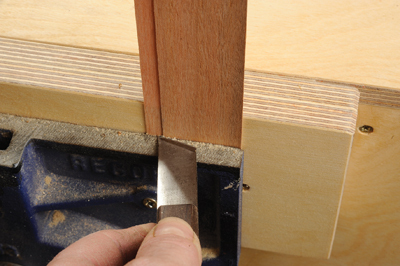 There is no set height, but, for example, you may need a slightly lower bench for working with power tools than you do when using hand tools. You must also protect your back from leaning over too far. 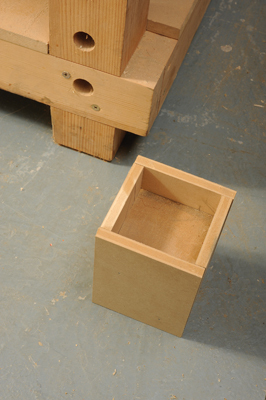 If a bench is too low, you can make socket blocks to lift the legs up. The bench had two layers of MDF as the worktop; this was functional rather than lovely and eventually got marked and damaged, so I overclad it with 15mm birch ply. This looks better and as the top is simply screwed down, when it too gets damaged it can be turned over. 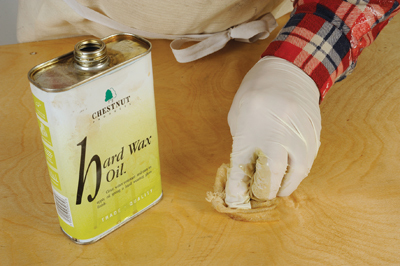 I wanted a tough, slightly golden finish to the very neutral colour birch so I chose Chestnut Hard Wax Oil. This is built up in a number of layers, after sanding first of course. It needs enough time to harden off before re-coating, but it seems pretty impervious to marking once set. The bench has a Record 52 1/2 E vice fitted to it. 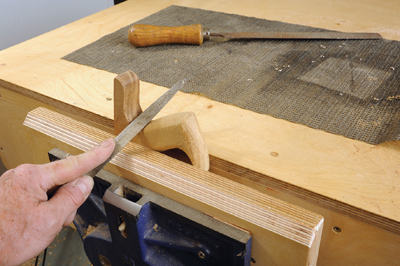 Unfortunately, the vice seemed to be slightly skewed and I could not easily get it dead parallel to the bench facing. A quick solution was to pack the movable jaw with slips of veneer to make the jaws close evenly. A last change, which I recently made, was to chamfer the movable jaw and the bench dog socket so it was easier to use the vice for awkward shaping operations. At some point I will reinstate the vice dog and fit bench dogs in the top, I'll keep you posted!